Sustainable building design was the highlight of DesignBUILD Expo 2017, held on May 3-5 at the newly reopened International Convention Centre (ICC) Sydney. Billed as the industry event of the year, DesignBUILD aims to bring together the architecture, building, construction and design communities under one roof. The event aims to foster closer collaboration towards developing the built environment in Australia and sending ripples on the global scale. One of the newest ventures of DesignBUILD is DesignBUILD RAW, a collaborative project that bridges the gap between industry and the academe. Launched in 2016 in Melbourne, DesignBUILD RAW invites students from leading architecture and design universities to compete in sustainable building design projects that will be presented to top industry professionals. The initiative made its Sydney debut last year, showcasing the budding industry talent from the University of Sydney (USD), the University of Technology Sydney (UTS), and the University of New South Wales (UNSW). DesignBUILD RAW 2017 featured remarkable designs for the feature Incubator stand, the two speaker theatres, and the breakout spaces around the show floor of ICC Sydney. The submitted projects were designed around the core themes of DesignBUILD, namely collaboration, compliance, innovation and sustainability. DesignBUILD RAW allowed students to dabble in real-life industry work, including; client briefing scenarios, supplier consultation and budget constraints in a professional setup. UTS emerged victorious for the design of the DesignBUILD Incubator stand. The winning entry saw the clever integration of plywood components: each panel folded to achieve structural integrity and balance. The unique idea was conceived during the summer elective classes of the Master of Architecture students. According to Paula Vigeant, the subject coordinator at UTS and DesignBUILD spokesperson, the students found "a lot of interest" in the Japanese paper-folding art of origami. The class studied the structural and dynamic properties of foldable materials towards developing a feasible design for a structurally sound system. The resulting project featured a smart system layout comprised of internally reinforcing structural columns. The walls of the structure are built up with bolted cover elements, screw rods and triangular inserts. 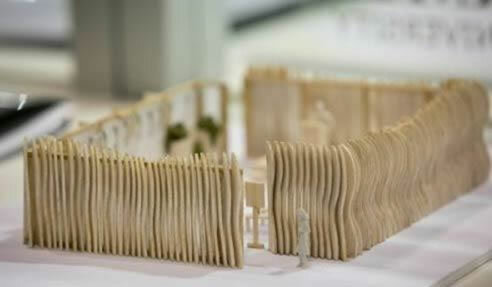 UTS also received critical acclaim for the 3D Installation Sketch, designed with recycled cardboard panels. The material was cut into triangular units, joined together by zip ties to achieve structural integrity. The 3D Installation Sketch was built to encourage students and guests to submit collaborative designs for the RAW space. For more information on sustainable building design projects, visit the official website of DesignBUILD at www.designbuildexpo.com.au. Stay tuned for updates on the upcoming DesignBUILD Expo 2018 - happening on May 2-4 at the Melbourne Exhibition & Convention Centre.